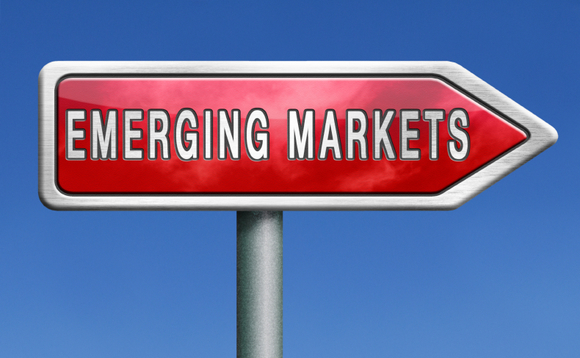 Why buy emerging markets for income? Whilst emerging markets are a highly volatile and highly cyclical asset class, they provide a compelling income opportunity, which is often overlooked by investors. We need only look at the divergence in total returns across EM countries this year to see evidence of the inherent volatility in the asset class. In USD returns, Russia for example is down 30% YTD. Meanwhile, at the other end of the spectrum, Egypt, India and Indonesia are all up close to 30% in positive YTD USD total returns. The cyclicality characterising emerging markets can make for a bumpy ride, but importantly it also creates opportunities. Investors who focus on companies that deliver sustainable income and are dividend oriented in their approach can somewhat mitigate this volatility. As we can see in the chart below, dividend per share growth of emerging market companies has outpaced developed markets even as emerging markets earning growth has disappointed on a relative basis. By prioritising income, investors can fish in a better quality pond of EM companies, those that choose to keep the interests of shareholders in mind. In the yield-starved global landscape, emerging market dividend equities are cheaper relative to their developed market counterparts. High dividend yielding emerging market equities are trading well below their historical valuation average currently, whereas US and European high dividend stocks are well above average. For investors concerned that the prospect of rising interest rates will derail an equity income based approach, consider that historical patterns show that there is actually a positive correlation between monthly stock returns and interest rate movements, when rates are rising from the low base we are currently at, as shown in the chart below. Source: Source: Standard & Poor’s, US Treasury, MSCI, FactSet, JP Morgan Asset Management. Returns are based on price index only and do not include dividends. The “initial reaction” represents the period during which, in our judgment, markets began pricing the first rate hike through the date of the second rate hike. The “subsequent market reaction” is the period from the second rate hike to a point determined to be the end of the rate hiking cycle. The “total reaction” is the market movement across the full rate hiking cycle. Looking across these categories, we have the ability to rotate exposures to various types of companies depending on the interest rate outlook. For example, we have brought down our relative weighting to the highest yielding equities, which function as bond proxies that are more sensitive to rate increases, and tilted towards more cyclical companies. Whilst cyclical companies do tend to be vulnerable to negative emerging markets sentiment, selective companies present compelling opportunities when we consider their attractive valuations. As good example is the Turkish steel manufacturer ErDemir. Whilst the stock may seem high risk for an income orientated strategy, it projects high single digit dividend growth going forward and is a beneficiary of both falling oil prices and lessened competition from regions such as Ukraine and Russia.